This literacy center includes 6 short o word family sorts. 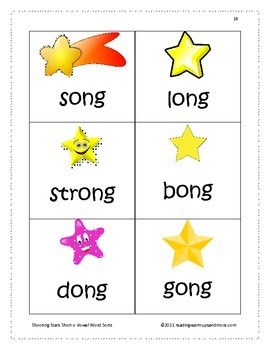 Choose the word family or word families that your students are working on and have the children sort the shooting stars word cards onto the corresponding word sort mats. Students will write the words that they find on a recording sheet. Word sorts range from 5 words to 18 words. 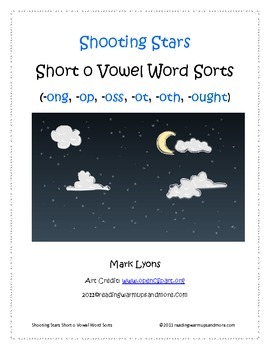 There are word sorts for -ong, -op, -oss, -ot, oth, and -ought. 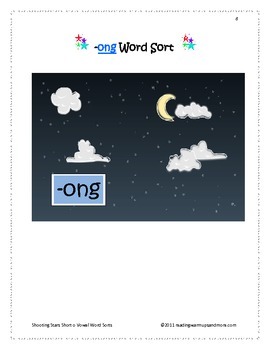 Also included are activities for the students to work on the short o word families. 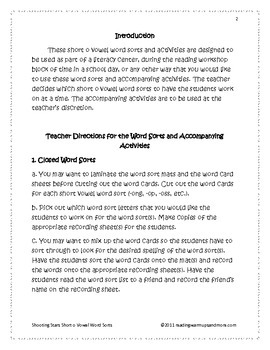 There is an open word sort for students to decide how the words can be sorted, a Write Around the Room activity, a Write From a Book activity, a Go Fish Word Sort card game, practice reading and spelling the word sort words, making a short vowel o book of the words that they are learning, putting the word cards in a-b-c order, and using letters and letter patterns to spell words.